On July 18th, Kevin’s little sister Ava Marie was born. I wish he could have met her, because she is every bit as cute as he was. He probably would have loved being a big brother. He would have been almost 4 years old now, and I imagine him having big smiles and laughing at the new baby. But the thing is, we wouldn’t have Ava with us had Kevin lived. We had decided to be done with having children and were happy with our girl and our boy. But after he died, we realized we couldn’t be parents to an only child. Our kids mean everything to us, and our lives are so much better and fuller because of them. So from the sadness of Kevin’s death came the joy of Ava’s life. When I look at her I sometimes think of Kevin, and how life can be unpredictable and not quite what I had in mind. It can send me back to changing diapers and sleepless nights after I thought those days were over. Ava was born at the hospital where Kevin died (technically he died in Iowa City, but everything happened here) so it was another instance of happy and sad moments in our life overlapping. The same hospital was the place of the worst day of our life and one of our best. We couldn’t help but think of Kevin while we were at the hospital. He was in our thoughts a lot, and there were some sad moments along with the happiness of having a new daughter. As you can imagine, we were asked a lot how many other children we had, etc, and that can get awkward. Some of the emotions come from just knowing that this was a happy moment in our life, but one that existed only on an alternate path from what we thought we had. The hospital stay was especially emotional because our room was overlooking the heli-pad, where Kevin was lifted by helicopter for Iowa City. When we were getting ready to leave the hospital, a helicopter was actually coming in. As we were walking out the door and I was going to get the car, the helicopter took off. It was loud and powerful and everyone around turned to watch it. I’ve found a few times since he died that the sound of helicopters is very uncomfortable for me, but I was overwhelmed in this moment. Here we were taking our new baby girl home from the hospital, surrounded by such a powerful reminder of the day Kevin was taken from us. I cried a little as the two conflicting emotions rushed over me. The moment that they took off with Kevin in the whirlwind of noise, wind, and lights is still vivid in my memory. A powerful, surreal, overwhelmingly sad moment. Those feelings came back to me, and it hit me that we had two children leave this hospital out this door, one bound for our car to be taken home, and the other bound for the helicopter at the end of his life. As the days and weeks tick forward with Ava, we are constantly reminded of Kevin. First of all, Ava is almost 4 weeks old and Kevin at that age would have still been 2 weeks away from even coming home from the hospital! 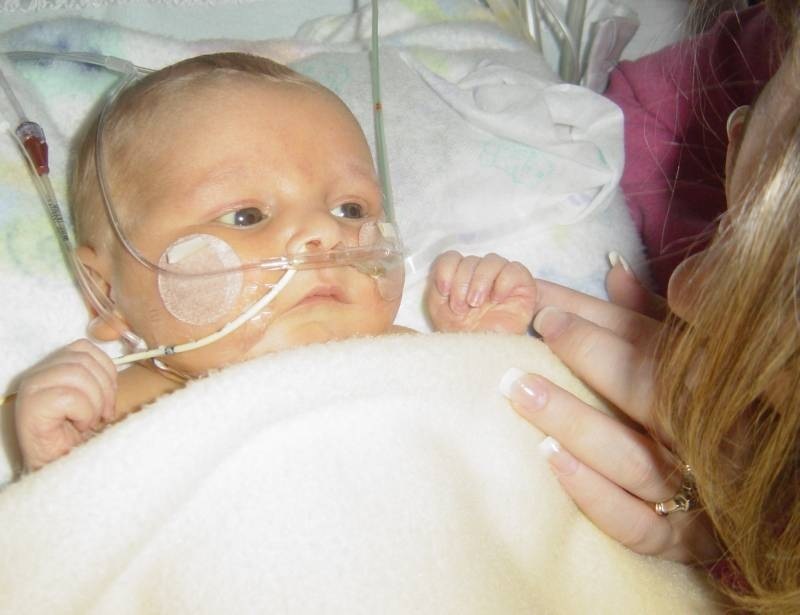 The length of time we were in the hospital with him is put into perspective even more now, and we realize how terribly draining and difficult that time was — and how much we missed out on during those early weeks at home. Seeing how healthy Ava is reminds us of how tricky and difficult it was to care for Kevin when he came home. Although diaper changes, feeding, and trying to work in some sleep is exhausting with any new baby, we haven’t been overwhelmed by caring for Ava. 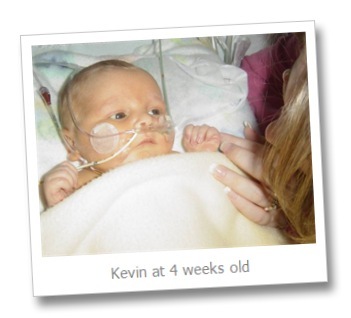 With Kevin, we had so many worries, so many medicines to give, tube feedings at night, constant puking, etc. Again, we realize in retrospect how difficult that time was. When I change Ava’s diaper or hold her, I still expect to see a pacemaker shape inside her abdomen, and it feels weird to be able to pick her up and not worry about that. I have told Dawn many times, “having a healthy baby is so easy!” But of course that’s just a matter of perspective. Having a new baby brings up lots of memories. We often talk about how Ava looks, moves, and acts and how that compares to both Kevin and Emily. We look at pictures of her and we see Kevin. We are reminded of lots of little things that Kevin did, and memories come back. That’s really nice, to be able to remember moments with Kevin and keep him in our conversations and talk about how he was like his little sister. I’m sure we will continue to remember and compare, for the next two and a half years, at least. We have pictures of Kevin around the house, and I have found myself in quiet moments whispering to Ava, “That’s your big brother Kevin. We’ll tell you about him some day. He would have loved you so much.” I know she doesn’t understand. Those moments are for me. I need to say those words, even though it’s hard to do without some tears. How I feel and act now with Ava confirms to me that I have been profoundly changed by Kevin’s life and death. I am happy and grateful for every moment in a way that I can’t really describe. It’s not just words or a way that I hope to live, but something I feel deeply and genuinely, in a way that is very real. I don’t get frustrated or upset by changing diaper after diaper, or losing sleep. I am just so grateful for every moment. I feel like I can really give everything I have and love fully, without holding back. Kevin’s death didn’t teach us to love our children cautiously out of fear that we might lose them and experience that terrible pain. Instead, we know that the only moment we truly have is right now, and the only way to live is to throw yourself fully into loving someone and give it everything you have. Although we found that perspective by going through a terrible experience, we are so grateful to have this approach to life become so real for us and to experience it daily with a new baby girl. These are the kinds of positive things that we can find from coming through the death of Kevin, and hopefully that new perspective will help us love and raise our new baby girl in a way that allows us to appreciate every moment even more and love her with everything we have. So many times I have thought how tickled Kevin would have been with his baby sister. It’s amazing how much joy a child can bring into our lives. Thanks for yet again another heart-felt post. I wondered how it would be for you and Dawn to deliver at Genesis, the place of so many of your memories. I hesitated to be at your delivery, wondering if that to would be too much of a similarity. I am honored and touched that I have had a part in your lives, the good and the very, very difficult. I often think of Kevin now that Ava is here. I find such joy holding Kruse babies (Emily included! ).